As a result of continuous roll forming with multiple pairs of rollers, the sheet metal roll forming machines can produce many thin, light, rigid and complex section profiles. Such as Roofing Sheets, Cladding Wall Panels, Purlins, Tiles, Floor Decks, Studs and Tracks, etc. 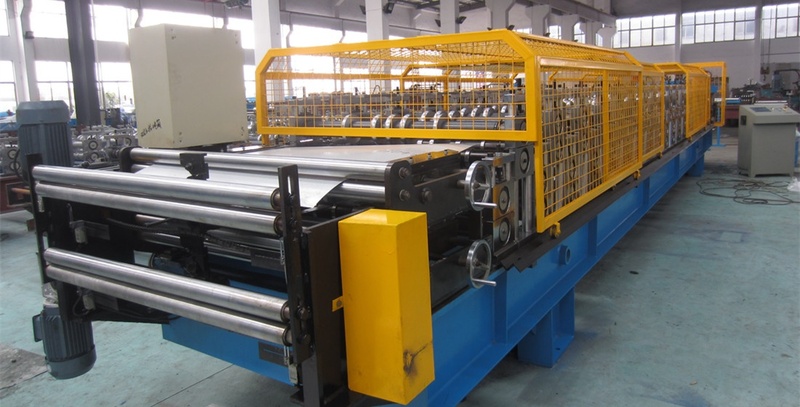 The process of sequential roll forming, which can be connected with a variety of technological devices, such as flushing, hoisting, reel, welding and so on, resulting in flow operation. So the production efficiency is very high and the cost is low. It is a special processing method widely used and popularized in modern processing products. low cost of coil and less cutting loss, thus reducing the total cost of materials. Production capacity us improved since the process is continuous. The Roll Forming Machine usually consists of 4 major components. Entry Section, Roll forming mill, Cutoff unit, Exit Unit. And also some auxiliary equipment also include. Only in few roll forming machines fed with precut sheets. In most case, the material is fed into the roll forming machines in coils. The coils are placed on Uncoilers(Decoilers). To utilize the potential of a roll forming machine, we should keep the machine running. In other words, minimize the stop-time. A large capacity uncoiler or double head(rotary uncoiler) is required. Or we can use a extra accumulator to storage the coils, but it is very expensive and less use in a roll forming machine. Roll Forming Mill is the main part of Sheet Metal Roll Forming Machine. We consider the profile of the steel product to choose a suitable roll forming mill. Cantilevered Mill, widely used for simple, narrow section. Duplex Mill, form the both edge of the narrow or wide product. Believe Industry use duplex mill for Door Panel Roll Forming Machine. Stud and Track Roll Forming Machine and Cable Tray Roll Forming Machine. The common point is all the product have various width. Standard Mill. the most used for sheet metal roll forming machines. Double High Mill. The mill is able to produce 2 different metal sheets with quick changeover time. Side by Side Mill. 2 sets of rollers installed on common shafts for narrow profiles. widely used in stud and track roll forming machine. There are several cutting method for sheet metal roll forming machines. Mostly, the finished product runs out on a steel rollers conveyor table. To reduce the cost of labor, auto stacker is generated.